Former NFL quarterback Colin Kaepernick, who protested against social and racial inequality in the United States by kneeling during pre-game anthems, is the face of a new advertising campaign by Nike. The ex-San Francisco 49ers player has been chosen to help mark the 30th anniversary of the brand's famous Just Do It slogan. The advert, which Kaepernick shared on his Twitter page, features his face alongside the message: "Believe in something. Even if it means sacrificing everything." Kaepernick, who has been without a team since opting out of his contract with the 49ers in March 2017, began kneeling during The Star Spangled Banner in 2016, to protest against police brutality towards African-Americans. Several players followed suit, and the 2017 season was marked by numerous protests during the pre-game anthems - much to the disgust of US president Donald Trump. Mr Trump spoke out against those involved and called for players to be fined or suspended by teams for taking part, igniting a fierce debate. 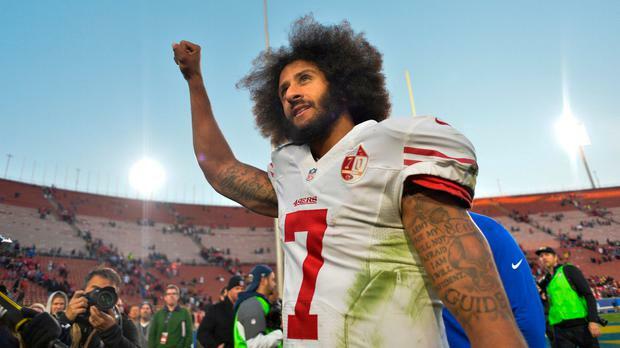 Gino Fisanotti, Nike's vice president of brand for North America, described Kaepernick as "one of the most inspirational athletes of this generation", telling ESPN: "(He) has leveraged the power of sport to help move the world forward." Kaepernick has filed a grievance against the NFL alleging team owners colluded to stop him securing a contract after he became a free agent. On Thursday it was ruled his case could go to trial. Lawyer Mark Geragos, who is representing the 30-year-old in a lawsuit against the NFL, said he was an "All American icon", tweeting: "Kudos to @Nike who realized @Kaepernick7 is an All American icon".